Ola Money Offer, Ola Money Cashback, Payzapp cashback On Ola Money App – Hello guys, Now get 10% Cashback on Ola Money App. When you add Rs 500 or more in Ola Money App with payzapp payment option. This offer is now live on Ola money app in association with PayzApp. Payzapp always come up with cashback offer On Payments, Now they are giving flat 10% Cashback when you load Rs 500 or more in your ola money wallet. Ola money with Payzapp comes to save you money. so guys be quick and grab this deal now. This Ola money Cashback offer is valid for all Ola Money users till 30th April 2018. To avail this offer read the instructions below. 2. After that Login / Sign up in to your Ola account. 4. Now go to payment page, there look for add money option and then select Others for payment option & there you will get PayZapp option. That’s it guys all you done, you will get your free 10% Cashback in your Payzapp within 5 working days. 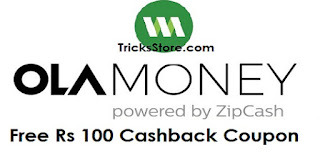 * Get Flat 10% cashback offer on loading OLA money through “Pay with PayZapp”. Only PayZapp registered users are eligible for cashback. * Max cashback Rs.100 per month. * Offer Applicable on all days ,(starts 00:00 hrs 1st April’18 and ends by 23:59hrs 30th April’18). * Select PayZapp as a Payment mode, Payment should be done on PayZapp’s Android & iOS app only. * PayZapp has the the right to end or call back any or all of it’s offers without any prior notice. * Cash back will be auto-credited within 30 working days after the date of transaction. * Offer applicable for all PayZapp registered users. * In case of offer mis-use, Cashback will be not be offered . * Cashback offer eligible only when ‘TAXI’ Promocode used at PayZapp payment page. * Customer should be a KYC customer at the time of transaction to avail any cashback.